This is an early comedy short from Edwin S. Porter, who would become the chief director for Edison Studios in the early twentieth century and the creator of the famous “Great Train Robbery” just a few years later. While this is a far less sophisticated film, it remains interesting as a stage in the development of American film and its celebrated director. We see a proscenium-style view of the interior of a photographer’s studio, with photo samples on the wall, a full-length mirror, a chair for portraits, and a camera to one side. A woman with a pinched face speaks to the photographer, who leaves her alone after a few seconds. She turns to look at the samples, and the display suddenly crashes to the floor. She then looks and the clock, and its hands suddenly spin crazily before it also comes crashing down. Then she checks her look in the mirror, which seems fine until she holds her fan up to her chin, and then it shatters. The photographer returns to see the destruction, and hastens the woman into the chair, perhaps hoping to avoid further chaos. He poses her, and she once again raises the fan to her chin. Suddenly she is flung back and a moment later a puff of smoke emerges from the camera, which has exploded because of her ugliness. There are a number of interesting points about this movie. In “The Emergence of Cinema,” Charles Musser reveals that the old maid is actually Gilbert Saroni, a “professional female impersonator,” apparently a vaudeville actor who specialized in ugly women. It’s a reminder of both the fact that early film was largely a male-dominated world and also that camp humor is older than Gay Liberation, though arguably its meaning is different in such a world. On the subject of both gender and sexuality, the Edison catalog ends its description with the line, “The picture finishes up with the old maid tipping back in her chair and losing her balance, displaying a large quantity of fancy lace goods. A sure winner.” This once again emphasizes the degree to which Edison was comfortable appealing to “vulgar” interests in its movies and ad campaigns. The movie is shot in a very typical style for the period, with a single shot from a single angle, with exits and entrances (by the photographer, at least), and a series of effects occurring for real in front of the camera. No camera trickery here: this could have been performed on a stage just as it appears. 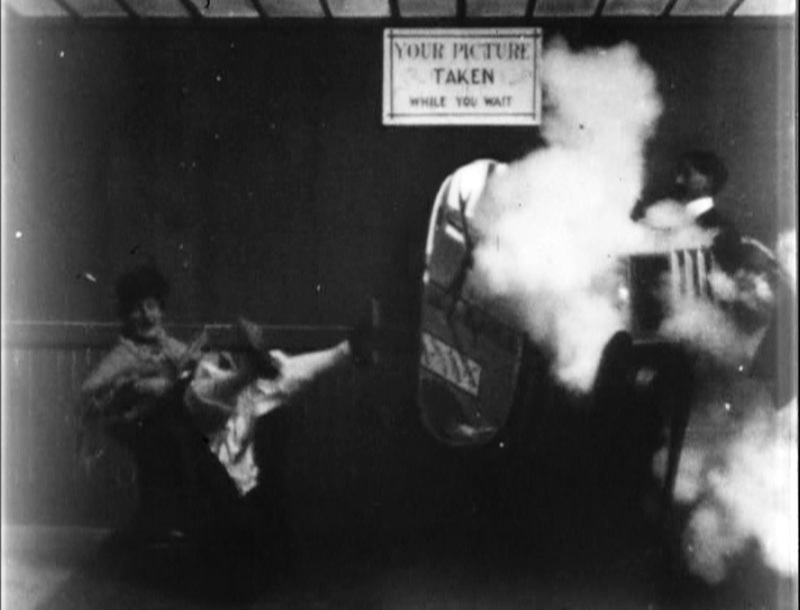 A final observation is the problematic timing of the explosion: the old maid observably reacts before the camera has exploded, but it never occurred to Porter to do a re-take.